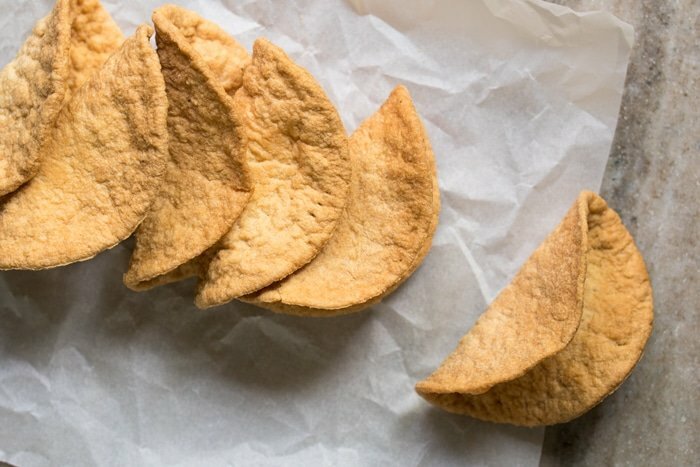 These gluten free and keto taco shells check all the right boxes: easy, extra crisp, and a perfect match to any and all taco fillings. 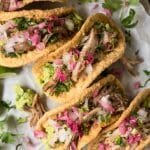 A frequent question with our infamous grain free keto tortillas is how to make some properly crisp taco shells (or tostadas!) with them. And it turns out you guys have three options, but my favorite is a quick shallow fry followed by a stint in the oven to get them extra crisp. 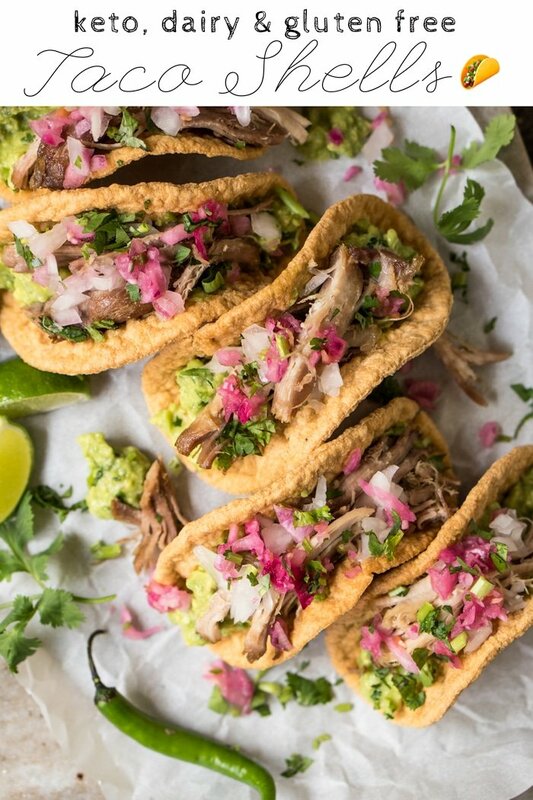 And while you can do the classic Texas-style ground beef etc, they’re also ideal vessels for our instant pot keto carnitas! Or simply an awesome pairing for some guacamole (cut up as tortilla chips!). As mentioned, our preferred method of cooking for these guys is some good old frying in lard (or coconut oil), followed by a stint in the oven to get them extra crisp. You see, a brief shallow fry puffs up the tortillas so you get the best texture this way. And don’t be intimidated, it actually involves very little more active time! But you can always just bake them directly. The results are slightly different, but nonetheless good and crisp. And last but not least, if you don’t care about the shell shape (or want to make flat tostadas), simply cook them over very low heat on your stovetop, turning them over every so often. 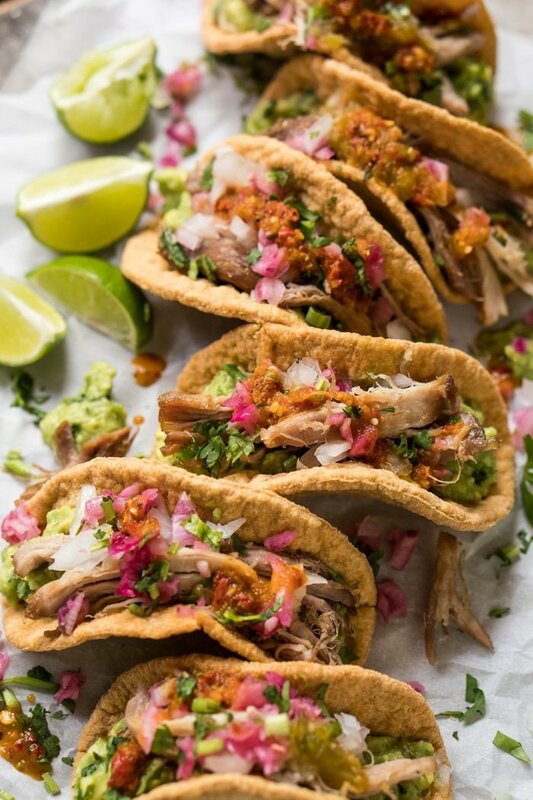 This is actually the traditional Mexican way of making tostadas, and it works the charm with our grain free tortillas too. Break the dough into eight 1” to 1 1/2” balls. Roll out between two sheets of parchment or waxed paper using a tortilla press (suggested) or with a rolling pin. The dough should be VERY thin as it'll puff up considerably when cooked. For your reference, each tortilla should weigh 26g uncooked. Heat up a pot or frying pan over medium/high heat and add lard or frying oil of choice (a centimeter or so will do). Once hot, drop the tortillas in batches. Cook briefly until they just begin to brown, and flip them over immediately. Transfer to a paper towel lined plate. You want to keep your taco shells as white as possible, as they'll continue to brown when baked. 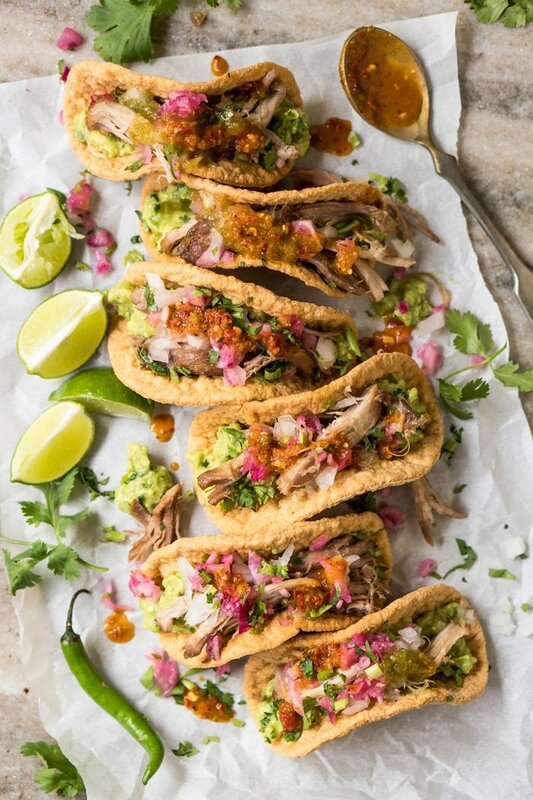 Make the curved taco shells by placing the fried tortillas half-curled in an upside-down muffin pan. Bake for 30 to 40 minutes until golden and crisp. Be sure to check in on them every 10 minutes or so the first time around. 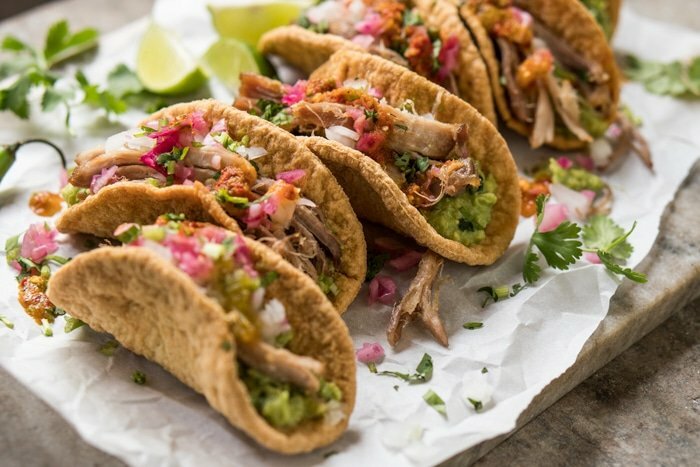 Make the curved taco shells by placing the raw tortillas half-curled in an upside-down muffin pan. Bake for 35 to 40 minutes until golden and crisp. Be sure to check in on them every 10 minutes or so the first time around. Please note that we estimated nutrition facts for a 30g fried serving (i.e. one tortilla = 8 chips). Uncooked, the dough should weigh 26g. Alternatively, you can make taquitos (like I did!) and get roughly 10-11. Just had to share with you. 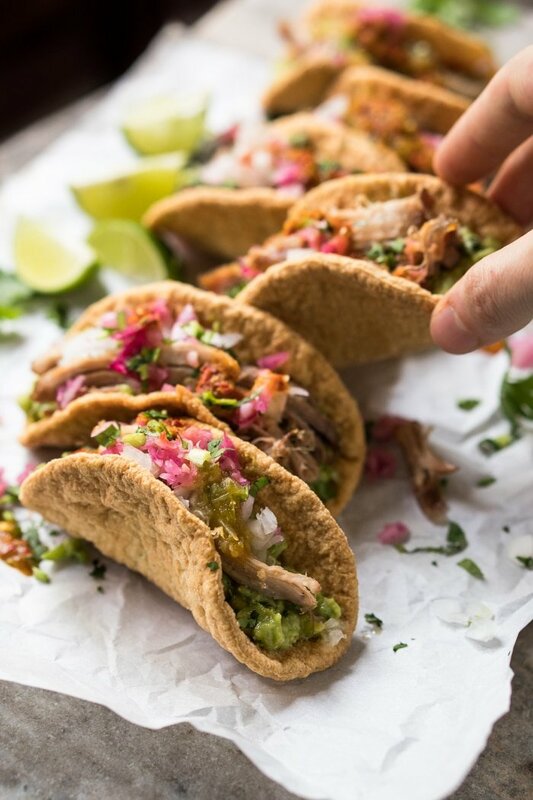 I made these for my friend who’s been eating keto/low carb for more than a year – and LOVES tacos! hehehe I made these by hand, then rolled my tortilla dough really thin so they didn’t actually puff like the pictures, but they turned out wonderfully as taco shells! My friend loved them and literally inhaled 5 tacos in less time than it took me to eat mine one as a taco salad! 😀 Wanted to share also, that I cooked some of these in the oven after the frying,as per the instructions; and did a few the “traditional” way: partial frying, then draping the tortilla over my spatula and frying one side at a time til a dark golden brown. It turned out *really* well that way, and looked more traditional. I think I’ll do them all like that next time! Ahhh what an amazing recipe!! So happy to be able to get a taco fix! Just made a couple of these up and even though they tasted delicious, they didn’t puff up at all. I followed the recipe to the word and used the method of frying them first. Any pointers on making them puff up? I usually meal prep on sundays, how long does this dough last in the fridge raw? How long does it last in a sealed container once cooked? Thanks! SO good! And easy. I love the flavor and texture of them. I made a double batch so I could make chips, too! A thousand thanks for such a great recipe. Super awesome to hear Jenn thank you!! April that’s so awesome to hear THANK YOU! And guess what? 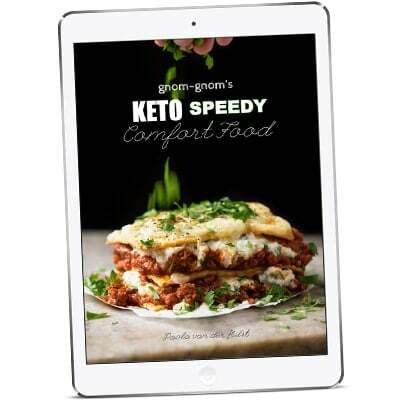 My first keto cookbook is being released this weekend with 60+ summer recipes 😉 Hope you guys enjoy it xo and good weekend! Hello! 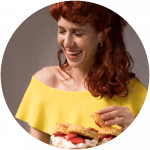 Thank you for your great recipes! 🙂 I love your tortillas and I’ve even used them to make paninis! Kathy I’m sorry to have missed your comment earlier! I cook them on a cast iron pan over very low heat (just like you do with regular tortillas) xo! With this, one of the world’s major dilemmas has been solved. Thank you! Lol! It’s my pleasure! xo! Wow! These look great. Can’t wait to try them! I’m just now beginning to experiment with making new recipes from scratch, so I need to ask a couple of newbie questions. We’re getting ready to go on house boat on a lake. I’d love to make these then. I doubt they’ll have a food processor available. Is there a good alternative method of combining the ingredients ? Or can I make the dough up in advance? Thanks for all your creative recipes. My cooking/baking to- do grows daily. Hi Diane! You can just mix them with a whisk and then by hand. The kneading takes a bit longer but it’s totally doable! xo and enjoy your holiday, sounds awesome!